We carry a wide variety of service parts and accessories including brake controllers, stabilizers, hardware, sealants, vents, plumbing, lighting, electrical, and much, much more. Lone Pine R.V. has a wide range of suppliers to draw upon giving us a hand up in looking for those hard to find rv parts. To help maintain the value of your hard-earned RV we can order in original OEM parts. 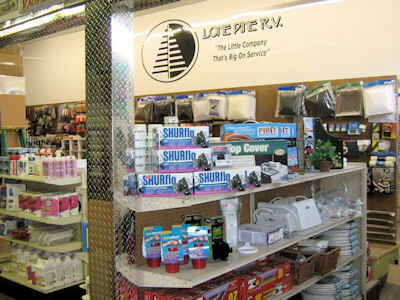 We stock a wide range of service and repair parts for all makes and models of RVs. Have a look at our parts catalogue and feel free to call or email for price and availability. Our knowledgeable parts team will be happy to answer any questions you may have.